Though denied by a Vatican spokesman, it has been widely reported in the media recently that Pope John Paul II may be about to make an infallible proclamation, recognizing Mary as the co-redeemer of the human race. Though a long-time Catholic doctrine, such a declaration would elevate the belief to the level of dogma. This would establish Mary's role as co-redeemer as part of the "deposit of faith," a divinely revealed truth, not simply a theological conclusion. The following excerpt from The Gospel According to Rome explains what the Church of Rome means by Mary's work of redemption and why this teaching is unbiblical. Bracketed numbers are cross-references to the Catechism of the Catholic Church. Photo to right: Notice the blasphemous nail scared prints in Mary's hands. Scripture is clear that the Lord alone is our redeemer. To Israel God proclaimed, "I, the Lord, am your Savior, and your Redeemer, the Mighty One of Jacob" (Isaiah 49:26). The New Testament Scriptures reveal that it is in God's "beloved Son, in whom we have redemption, the forgiveness of sins" (Colossians 1:13-14). God justifies sinners "through the redemption which is in Christ Jesus" (Romans 3:24). The Church's claim that Mary offered Christ "on Golgotha to the Eternal Father"(14) contradicts Scripture. The Bible says that Christ "offered Himself without blemish to God" (Hebrews 9:14). 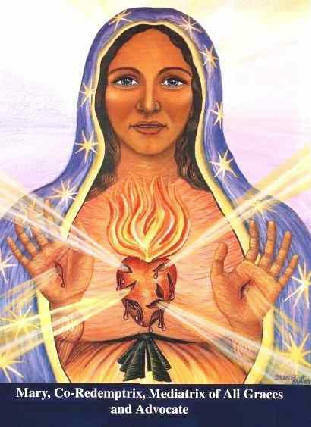 In her, the many and intense sufferings were amassed in such an interconnected way that they were not only a proof of her unshakable faith but also a contribution to the Redemption of all. This imagery, however, is based upon a faulty translation of Genesis 3:15 from the Latin texts of the Vulgate Bible, the official Bible of the Roman Catholic Church since the fourth century. Until recently, the Latin Vulgate served as the base text for all Roman Catholic translations, including the English Douay Rheims Bible. In the Hebrew text, the original language of the Old Testament, the subject of Genesis 3:15 is masculine, not feminine. Therefore, rather than reading "she shall crush thy head" (Genesis 3:15, Douay Rheims), the verse should be translated "He shall bruise you on the head" (Genesis 3:15, NASB). The verse is prophetically speaking of Christ's victory over Satan, not Mary's. Though recent Roman Catholic translations have corrected the error, Roman Catholic theology remains the same. As Mary watched her Son hanging on the cross, she undoubtedly suffered greatly. However, the same could be said of the others present who loved the Lord and witnessed His sufferings: John, Mary Magdalene, Salome, Mary the wife of Clopas (John 19:25-27, Mark 15:40). We might describe the nature of this kind of sorrow as the suffering of compassion. It is also likely that Mary, even as Christ, endured the taunts and ridicule of evil men. She did so willingly, knowing that God had called her to serve as the mother of Jesus. Scripture describes this kind of persecution as suffering for the sake of righteousness (1 Peter 3:14). Reproach has broken my heart, and I am so sick. Apparently, neither Mary nor any of the others at the foot of the cross were even aware that before them the Son of God was suffering for the sins of the world. Despite the intensity of Christ's physical sufferings, the Scriptures consistently link our redemption not to his pain, but to His death. Paul writes that "we were reconciled to God through the death of His Son" (Romans 5:10). The writer of Hebrews reminds us that "a death has taken place for the redemption of the transgressions" (Hebrews 9:15). John tells us that Jesus "released us from our sins by His blood" (Revelation 1:5). The reason, of course, is that the penalty for our sin is death (Genesis 2:17, Romans 6:23). A life, therefore, had to be given to redeem us. That is why Christ came: "to give His life a ransom for many" (Mark 10:45). Christ "died for sins once for all, the just for the unjust, in order that He might bring us to God. . . ." (1 Peter 3:18). Nowhere do the Scriptures teach that we were redeemed by Christ's righteous life, faithful obedience, or even His sufferings at the hands of cruel men. Here again the sufferings of Mary fall short of being redemptive. The Church claims that "Mary suffered and, as it were, nearly died with her suffering Son,"(23) that she "in her heart died with him, stabbed by the sword of sorrow. "(24) But the fact of the matter is that Mary did not die on Calvary. Christ alone gave His life for our redemption. That is why God sent His Son, the Lord Jesus Christ, to redeem us. He alone was qualified. Since He was the Son of God, His life was of infinite value and able to redeem all mankind. Having been made "in the likeness of men" (Philippians 2:7), He was capable of both representing humanity before God and physically dying (Hebrews 2:14-17). Since He was without sin, His life was an acceptable sacrifice (1 Peter 1:19; 2:22). Christ alone, therefore, deserves the title of Redeemer. "Worthy is the Lamb that was slain" (Revelation 5:12). 1 Catechism of the Catholic Church, 973. 2 Second Vatican Council, "Dogmatic Constitution on the Church," no. 56. 3 Pope Benedict XV, Inter Sodalicia. This quote and some of the others which follow can be found in a collection of statements by recent popes compiled by Francis J. Ripley, Mary, Mother of the Church (Rockford, IL: Tan Books, 1969). 4 Pope Pius XII, Mystici Corporis. 5 Second Vatican Council, "Dogmatic Constitution on the Church," no. 58. 6 Pope Pius XI, Explorata Res. 7 Pope Benedict XV, Inter Sodalicia. 8 Pope Pius XII, Ad Coeli Reginam. 9 Pope Leo XIII, Ubi Primum. 10 Decree of the Sacred Congregation of the Holy Office, "Indulgences," June 26, 1913, published in Acta Apostolicae Sedis. Also refer to Henry Denzinger, Sources of Catholic Dogma (St. Louis, MO: Herder Book Co., 1957), p. 502, article 1978 a and footnote 2; A. Tanquerey, A Manual of Dogmatic Theology (New York, NY: Desclee Company, 1959), vol. 2, p. 108-109; and Ludwig Ott, Fundamentals of Catholic Dogma (Rockford, IL: Tan Books and Publishers, 1960), p. 212-213. 11 Pope Pius IX, Ineffabilis Deus. 12 Pope Leo XIII, Adiutricem Populi. 13 Pope Pius XII, Ad Coeli Reginam. 14 Pope Pius XII, Mystici Corporis. 15 Pope Benedict XV, Inter Sodalicia. 16 Pope John Paul II, Salvifici Doloris, no. 25. 17 Pope John Paul II, Salvifici Doloris, no. 25. 18 Second Vatican Council, "Dogmatic Constitution on the Church," no. 61. 19 Pope Pius IX, Ineffabilis Deus. 20 Second Vatican Council, "Dogmatic Constitution on the Church," no. 57. 21 Pope John Paul II, Salvifici Doloris, no. 25. 22 Pope John Paul II, Salvifici Doloris, no. 25. 23 Pope Benedict XV, Inter Sodalicia. 24 Pope Leo XII, Jucunda Semper. The above is an excerpt from The Gospel According to Rome by James G. McCarthy, (©) Copyright 1995. It may be reproduced in its entirety, without editing, as long as it is distributed as "freeware" (without charge) and this copyright and contact information is included. It may not be used without the permission of Good News for Catholics for resale or for the enhancement of any product sold. This book is available from us or from your local Christian bookstore. For purchasing information see the GNFC price list and order form.